Q: I am looking for a non-simultaneous exchange of our second home in London. Do they happen through your organisation? A: Like you, the majority of Home Base Holidays members able to do non-simultaneous home swaps are listing a second home for exchange. You can easily see which are second homes by the house icon with the number '2' (as above) beside such listings in the brief descriptions you first see when you do a search. You can also confine your results to only second homes by using Advanced Search. Tick the Second Home box (you can also choose country, city, etc) and click Search (bottom right of the page). Members interested in non-simultaneous exchanges will indicate within their descriptions when their homes would be available. Information can also be included in the destination box to draw attention to the fact that your home can be available at other times than the dates you want to be away yourself, e.g. Open to offers (can be non-simultaneous). Small, quaint, Cape Cod style house, 1/2 hr from Newport, 1 hr from Boston, 2 hrs to Cape Cod, 3 hrs from New York city. Typical New England area, lots of history. 13 successful past exchanges and still loving it! Retired teacher and wife seeking 14th home exchange. Love walking, flea markets, theater and fun experiences. Have loved all of our wonderful past exchanges all over Europe! 'I work for A Place in the Sun' magazine, the travel and property title produced in association with the Channel 4 series. We're planning a feature on home exchange, as we thought it would be a good way for people thinking of moving abroad to 'test the water'. By coincidence I had added a post on 20 Dec on this very subject! See: Exchange Homes - Try Out a New Country Before Moving. If you would be available shortly after Christmas to talk to Jo about your exchange, please let me know. I will pass your message to Jo who will contact you directly. 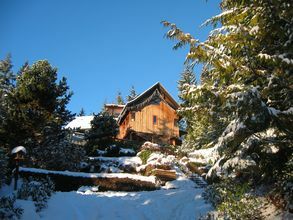 As I look out the window on a very wet and windy December day in London, this photo brings back memories of Christmas holidays in Canada - snow, pine trees, clear blue sky and a lovely cedar house high in the forests of British Columbia - perfect! This West Coast home, available for exchange, is surrounded by beautiful vistas in a completely private location yet only 20 minutes from downtown Vancouver and just over an hour from Whistler. Check out the full home exchange offer and view more photos, HE16062. Happy holidays to all Home Base Holidays members and home swappers all over the world. Although the majority of Home Base Holidays members use home exchange for relatively short vacations, some members swap homes for lengthy periods (sometimes when on a sabbatical break from work or once retired) while a few use a home exchange home as a base to check out another country or area before moving there. For those serious about making the big break, an initial home exchange does make sense, providing a rent-free place to stay in an area you are considering and giving you the chance to experience a neighbourhood from a resident's rather than a tourist's perspective, check out properties for sale or rent in the area and look for work opportunities (if you aren't retired). There is now much information available for would be ex pats, from whatever country, on all the issues that need to be considered before moving to another country (tax implications, cost of living, schooling, healthcare, pensions, etc). One website/blog + newsletter on the subject is Shelter Offshore which has a large number of articles and useful links on these issues and on various countries you might be considering for a permanent or temporary move. Picture this for a perfect holiday. You walk through the doors of the villa that you have booked for a two-week stay and see that you have an entire house to yourself for the duration of your holiday, with a beautiful swimming pool and garden. Already, you imagine relaxing with the water lapping at your feet and the sun's rays beating down on you without a care in the world. And what's more, you only had to pay for the flight.